Scottsboro, AL – Alabama may not be the first state to come to mind for purchasing ski gear and apparel, but Scottsboro is home to a gigantic clearinghouse of lost luggage. 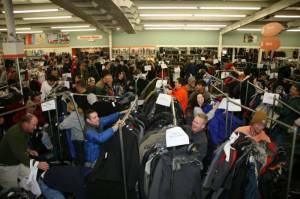 To get the first look at top winter and ski equipment from brands including The North Face, Columbia, REI, Arc’teryx, Marmot, Burton, Nordica, K2 and Rossignol, shoppers will start lining up the night before Unclaimed Baggage Center’s 35th annual Winter and Ski Event. Doors will open on Nov. 5 at 8 a.m. CST for the sale featuring thousands of items that are held specifically for this exclusive event and have not been previously been displayed on the store floor. Unclaimed Baggage will host contests and special events throughout the day for shoppers. One event will be the 60-second showdown with three guests racing to try on the most ski apparel in a 60-second time period. The Unclaimed Baggage Center is a unique 40,000-square-foot shopping destination, which receives one million visitors per year from every U.S. state and over 40 foreign countries. Merchandise in the store includes unclaimed baggage and freight and lost articles purchased by Unclaimed Baggage Center following an extensive search for its owner. For more information about the Unclaimed Baggage Center or the Winter and Ski Event, visit www.unclaimedbaggage.com.